Ukulele Guy – Page 3 – All things uke, all the time. Meet the World’s Largest Playable Ukulele! I'm not exactly sure how I found this. Oh wait, yeah I am. So, I setup an automatic eBay search to tell me whenever a Tangi ukulele gets posted. Why would I do that? Hmm.. maybe you haven't heard of the miniature Tangi ukulele? This thing makes the Kala Pocket Ukulele look like an upright bass. So, I MUST have one, thus the automatic search. Well, you can imagine my surprise when my eBay search net caught a whale instead of a minnow. 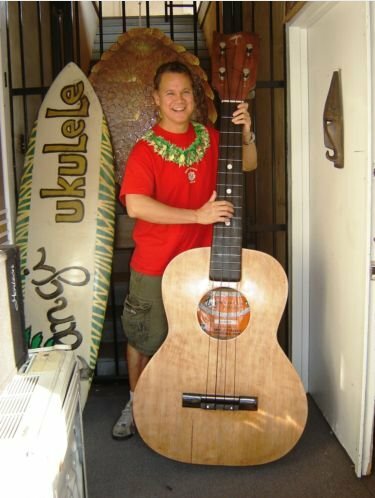 Yup, besides making the world's smallest ukulele, Tangi also makes the world's largest playable ukulele. Look at this freaking thing! It makes an upright bass look like... well, I guess it would still look like an upright bass. But, this thing is HUGE! What's more, it's for sale on eBay (click the picture). But, get ready for disappointment, unless you are some sort of debutante or one of the Koch brothers. A cool five grand is what it's going to take to get your hands on that baby. Plus, you still need to drive to Hawaii and get it. Yes, drive.... floating car. Duh. Anyway, here's some more details on this monster. It weighs 40 lbs and is 6 1/2 feet tall. Tangi made the ukulele in 1996 for Tangi Tully's birthday. It took 27 Tangi employees a full month to build it. This giant ukulele is completely tunable and playable. The tuners were custom machined. The body of this massive ukulele is mahogany and the fretboard and bridge are ebony. The white inlay is made of ox bone and the inlay is mother of pearl. In short, this isn't a cheap decoration. This is a freaking work of art. Now, give me money so I can buy it. Posted on December 1, 2011 September 30, 2016 Categories Ukulele NewsTags giant ukulele, one of a kind, tangi, world's largest ukuleleLeave a comment on Meet the World’s Largest Playable Ukulele! As you probably all know, I'm an unabashed Stephin Merritt groupie. Magnetic Fields, Gothic Archies, you name it. I like it all. I just can't get enough of his gloomy pop melodies. So, of course I was going to buy the new record, Obscurities. This was right around my birthday, that I went looking. And, sure enough, when I tried to purchase the CD, Amazon warned me that someone might have already bought it for me. Eh?! Huzzah! Turns out it was my sweet peach of a wife. Anyway, the whole record is pretty good, but two songs, in particular, really stand out. The first is the more electronic version of "I don't believe you" (a folkier version having been released on the "I" record). The second highlight of the record is a previously unreleased song called "When you're young and in love". And, that's the song I can't get outta my blasted head. So, I attempted to exorcise it through ukulele video. Since I couldn't find any chords for this song already posted out there, I came up with the following arrangement. The only questionable chord in there is Dm7. But, I didn't have the CD handy when I did this so I couldn't really compare it. When I listen to it again, I'll update these chords if that Dm7 sounds goofy. I just randomly stumbled across this video recently. It looks like it was also featured on NPR, so I'm not sure how I missed it there. Anyway, it's Lisa Hannigan (who I might need to learn more about). She has an amazing voice and she's Irish. So, that's a win/win. Oh yeah, and she plays ukulele! I guess they filmed this video in Dublin and they did it in one take. Once you see the video you'll see why she might have been reluctant to do a second take. It seems like they start off having the different paint represent different instruments but then it sorta goes haywire. Anyway, it's a nice little song, even if the ukulele isn't the main component. As I mentioned in an earlier swagerty post, I have a Treholipee that has a broken tuning paddle. As I also mentioned in that post, I got an e-mail (from a fella named Larry) describing how he fixed a similar problem. I wanted to post it here (with Larry's blessing) so other enterprising folks can make use of this info. If you recall, Larry managed to pick up a Treholipee for a $1 at a garage sale (for this, I will always be jealous of him). 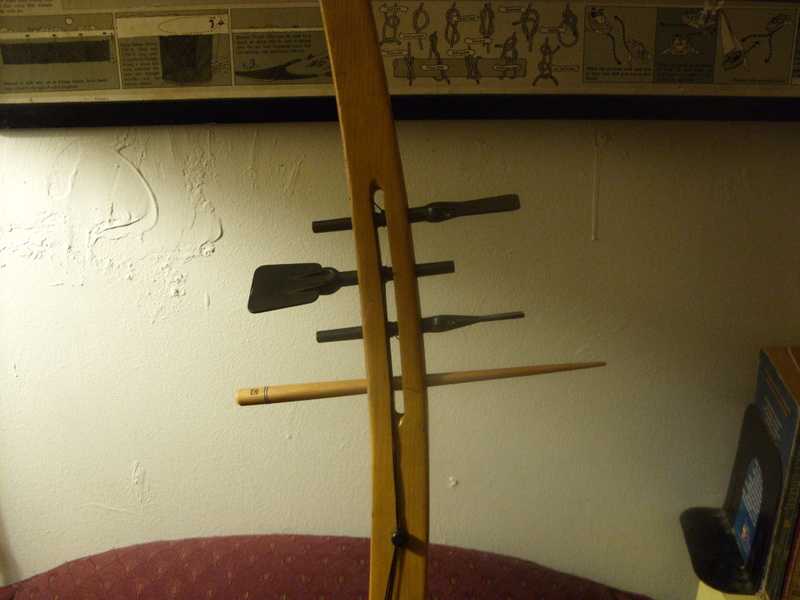 His Treholipee, like mine, is missing a string as well as a tuning paddle. Now, Larry is using fishing line to replace his strings. well once you let it stretch in a few days (and it costs a WHOLE lot less!). If you don't fancy fishing line, though, you can get Worth tenor ukulele strings in lengths of 46" and that should work for you. Now all he has to do is cut it to length and stain it black. I should mention that another suggestion I got on paddle repair was to use a clay mold of one of the other paddles and possibly cast it out of plastic. If I can get motivated, I might try that out and I'll let everyone know how it goes. I decided that I did'nt need to learn new chords if I would simply string it like the top 4 strings of my banjo, open G (DGBD). Good idea, but much too low. Some strings buzzed. A little research showed that some uke's are tuned to an open C but not the same as a banjo open C. I put a capo on my banjo at the 5th fret and found that GBEG was the open C tuning that would let me take advantage of my knowledge and still play this sweet little instrument like a pro. All of my wife's doubts were swept away when I serenaded her with "Tonight you belong to me".